A major “outcome” of Prime Minister Narendra Modi’s recent Saudi visit (April 2-3), highlighted by his “spin doctors”, is that the two countries are entering an unprecedented level of cooperation and coordination in the security field in the fight against terrorism. Facts, however, have come to light suggesting that the India-Saudi Arabia joint statement seeks to target Iran, and not Pakistan, for terrorism. “Of course, our security czars had assumed that Modi brilliantly secured Saudi Arabia’s support in controlling Pakistani state-sponsorship of terrorism”, Bhadrakumar, who served in the Indian Foreign Service for three decades and served as ambassador to Uzbekistan and Turkey, regrets. Apart from two postings in the former Soviet Union, his assignments abroad include South Korea, Sri Lanka, West Germany, Kuwait, Pakistan and Afghanistan. 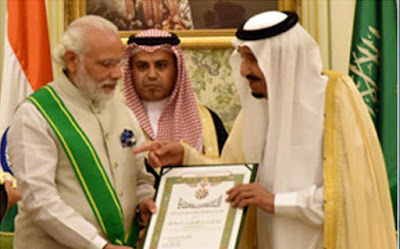 “Perhaps that explains why Saudi King Salman felt so obliged to Modi as to confer the Abdulaziz Sash (the highest Saudi civilian honour), our PM’s controversial reputation on the Arab Street as the ‘butcher of Gujarat’ notwithstanding”, Bhadrakumar underlines. “Unsurprisingly, adrenaline began flowing in the Saudi veins and they have since imposed new measures against Iran by closing the Saudi air space to Iranian civilian flights and prohibiting tankers carrying Iranian crude from transiting Saudi waters (here and here)”, he says. “Salman probably concluded that with Modi on his side, Iran’s regional ‘isolation’ is now complete. Indeed, the Saudis have offered to Modi that they can replace Iran as India’s key energy partner in the region. They are paranoid about the prospect of an imminent reset of India-Iran ties”, he points out. “The Abdulaziz Sash was conjured up only in the seventies and Zia-ul-Haq narrowly missed it, despite being the best-ever friend Saudis ever had. But the glaring absence of any of Pakistan’s civilian leaders will be noted. Obviously, Saudis think that power flows through the barrel of the gun in Islamabad”, he points out. “Interestingly, the recipients also included Ali Shamkhani, formerly Iran’s defence minister (currently heading the National Security Council), a British naval chief, the chief of staff of Japan’s Maritime Self-Defence Force, a NATO commander and a French air chief – and, intriguingly, a British ambassador by name Alan Munro”, Bhadrakumar says. “Indeed, Saudis adopt strange criteria. The Arabian king’s wandering mind apparently takes fleeting fancy for someone for reasons best known to him. What could it be about Modi that arrested King Salman’s meandering thoughts – the 80-year old monarch suffers from Alzheimer’s – we do not know”, he adds.